Learn to Love Long Scrolling Websites… or Get Left in the Past! Once upon a time, websites that scrolled on and on were seen as a death knell for businesses’ online presence, including dental practices. People weren’t going to scroll for more information; if you didn’t have all your information “above the fold,” it was essentially lost in the internet ether. Then came 2015 and the shift to mobile. As you know from our previous blog posts, including “Generating Patients for your Practice using a Custom Dental Website,” about 60 to 70% of your viewers are visiting your site from a mobile device. So, in order to stay relevant, web designers had to reconfigure the look and feel of websites. That shift took long scrolling sites from the losing column of web design over to the winning. Users have become accustomed to scrolling with ease; it’s often easier to scroll and find what you’re looking for versus clicking on a page and waiting for it to load. Look at young kids today; hand them a smartphone or tablet, and they’ve got scrolling down pat! A long scrolling website gives us the opportunity to include more words, images and videos on your homepage. Google loves all of these things and will reward your website with better search results compared to your competitors with minimal content on their homepages. The length of time a visitor stays on your website is a ranking factor Google considers when pitting your site against other dentists in your market. It’s simple: the longer someone stays on your site, the better positioning you’ll see in search. Engaging content, images and video keeps visitors on websites. Bounce rate is another metric Google looks at when ranking websites. This is a percentage of single page visits (where someone exits on the same page they landed on) and is a good indicator of the quality of your website and its content. If your site is built in a way that encourages visitors to learn more about you through scrolling, clicking buttons and visiting multiple pages – bounce rate stays low. You don’t want to look like everyone else, and the story of your unique practice deserves to be told in a way that is exciting and engaging. Simply put: a long scrolling website gives us the opportunity to tell your story more effectively. Using custom design, photographs and video, we can excite visitors to read, listen and learn about you. When they do that, the phone rings. Just because you have the green light to incorporate long scrolling into your website doesn’t mean you can slap it in there without parameters. Viewers still want to maintain ease of use in their viewing experience; otherwise, they’ll click onto another site and leave you in the rearview. Viewers need to know that there is more to the story. If you don’t provide them cues, they might just think you messed up and left an article unfinished. Something as simple as adding an arrow pointing downward or the text, “Scroll Down,” will let them know there is more to come. Animations also make scrolling a fun, interactive experience. For instance, as you scroll past content, new content can animate in from the left or right to keep the visitor engaged. Guiding your viewer along the designed “roadmap” of your site is a little more subtle on mobile devices than on desktop. It’s essential, though, to ensure people don’t get lost on your site. Design elements such as the hamburger or a hidden navigation bar when scrolling down (e.g. Facebook) provide users navigation of the site. When viewers are scrolling through your site, you always want to keep certain components readily available. For instance, you want your patients to always have the ability to call you to schedule an appointment, even if they’re in the middle of reading an article. Elements like call functions, location and hours are your calls to action, and by making sure they are always visible to your viewers, even if they are scrolling, you’re making their viewing experience much more user-friendly. So, if you’ve shied away from long scrolling as a matter of principle, hopefully you now see the benefits of adding it back into your site. But, first things first. You need to make sure your site is easily viewable on a mobile device. Remember, that’s the key to why we got to a place where long scrolling is acceptable! As we’ve recommended before, if you haven’t had the time to complete this exercise before now, we encourage you to take a few moments to do this. Grab your smartphone and enter in your dental website address. If you can easily scroll through the site and view all the components as you would have them built, then congratulations, your site has been redesigned for mobile device viewing! 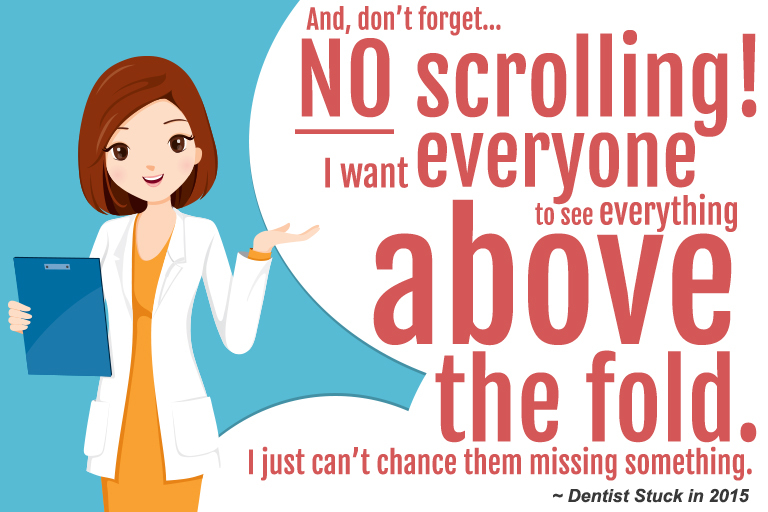 If you struggle with being able to pull up certain elements and if your functionality is not conducive to your touchscreen (zooming in and out to locate content and read tiny text), then it’s time to give us a call here at TNT Dental. We can help get you on track. Our team is specifically geared to taking your website design and reconfiguring it for mobile devices; this way, you can make sure you’re capturing all your patients, both existing and potential! Tim Kelley is one of the founders of TNT Dental, the #1 creator of custom websites and marketing strategies for dentists. 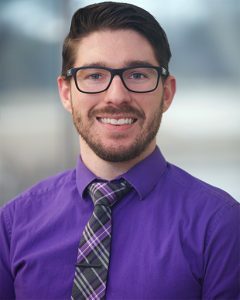 Recognized as a leading expert in helping dental practices grow, Tim is passionate about harnessing the power of online marketing to attract and keep new patients. If there is anything Tim can do to help you, please do not hesitate to contact him directly at the office, (877) 868-4932, on his cell, (972) 989-9137, or via email at tim@tntdental.com. Of course, you can always visit www.TNTDental.com to learn more.